The rugged landscape of Powys on the border of England and Wales has been attracting outdoorsy types for decades. With the Brecon Beacons National Park in the south of the county and Snowdonia National Park on its north-eastern edge, this is a landscape that begs to be explored. 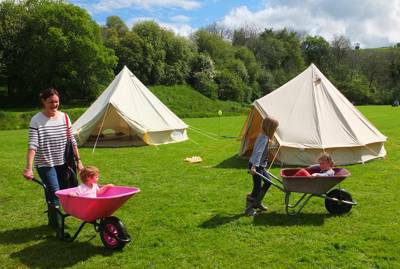 It’s little wonder then that camping and glamping are popular ways to stay here. It’s a region of mountains and heather moorland, rivers, wooded valleys and waterfalls. It’s also home to quaint Welsh villages and fascinating towns including literature-loving Hay-on-Wye and the food hub of Abergavenny. 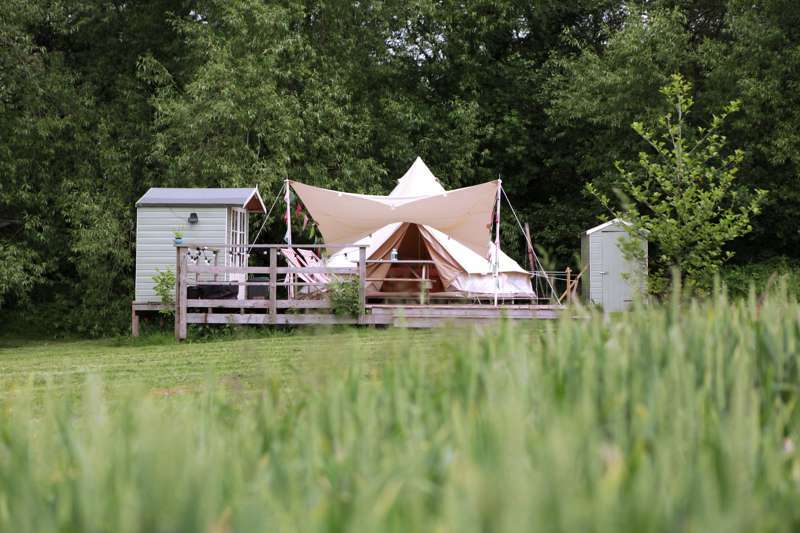 Whether you're looking for a place to pitch a one-man tent while you're on the trail, a family-friendly site that's great for kids or an upscale glamping getaway, our Powys collection has got it covered. Powys is Welsh border country and for campers and glampers heading west from England, you couldn’t wish for a better welcome. This Mid Wales county is a land of rugged beauty with high mountains and moorland, river valleys and woodland. 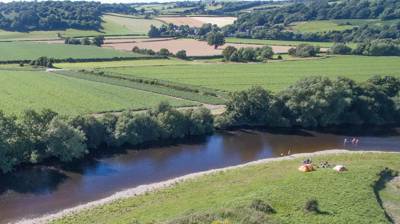 It has no coastline but water is an ever-present feature of the landscape with the rivers Usk and Wye meandering through along with countless streams, glacial lakes and impressive waterfalls. 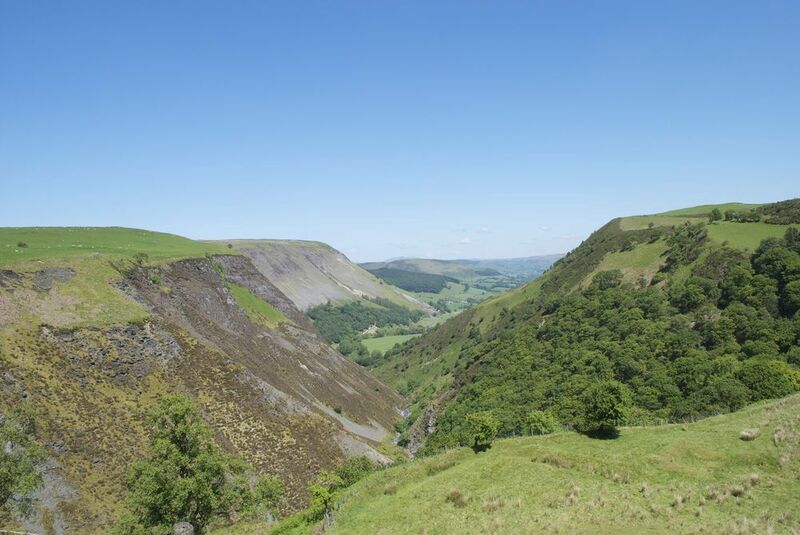 The best campsites in Powys are nestled in to this stunning scenery in a way that’s in keeping with the environment giving you access to its many treasures. 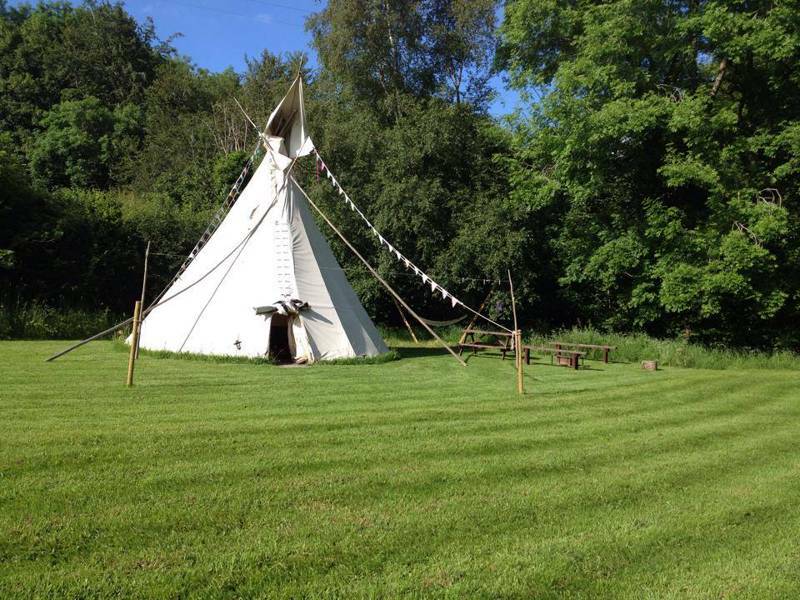 There are places to pitch tents by riversides, in farmers’ fields and among the trees of woodlands and there’s fantastic glamping accommodation too from traditional tipis to modern tree tents and geodesic domes. It may be the biggest county in Wales but Powys still feels like it’s been blessed with more than its fair share of Welsh wonders so you won’t find yourself wanting for things to do on days out from the campsite. You can walk along Offa’s Dyke Path national trail or hike up Pen-y-Fan in the Brecon Beacons National Park. You can watch the stars under Wales’ only Dark Sky Reserve and marvel at the geology of Fforest Fawr Geopark. You can learn about Welsh history at its castles and historic sites and soak up the region’s culture in its towns and villages. 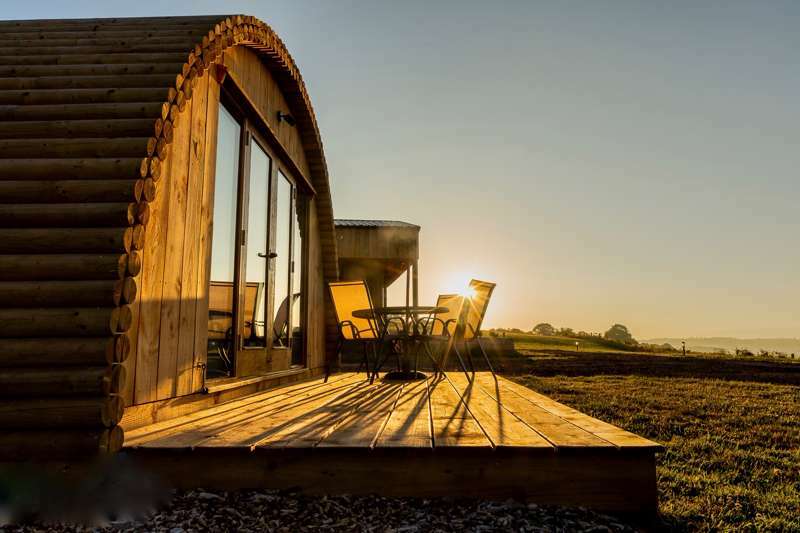 The eco-friendly nature of camping and glamping holidays means you’re unlikely to leave a lasting impression on this spectacular landscape but it's certain to leave one on you. Back-to-basics tent camping is probably the greenest way to holiday and the best value too. We have a soft spot for this sort of camping and if you’re in Wales to hike in the mountains, kayak down rivers or take on one of its epic trails, classic camping will suit your sense of adventure. Pitching your own tent in Powys gives you the chance to be completely immersed in the stunning scenery of this region of Mid Wales. There are places to pitch tents by rivers, in view of mountains and hills and in farmers’ fields in the middle of beautiful countryside. You can wake up to the sound of birdsong and drink in the views with a cup of cocoa as the sun sets. Some sites keep it simple and offer basic facilities which will suit campers who are self-sufficient, many with campfires allowed, while others pride themselves on offering more than the average campsite. Our collection features sites that are smaller and usually independently run which usually means a more personal feel and a friendly atmosphere on site. There are sites which are family friendly and sites which cater well for couples and individuals. If you like the sound of enjoying the great outdoors but haven’t got the gear or the get-up-and-go to pitch your own tent, all is not lost. Powys has a great range of glamping sites and a real variety of glamping accommodation within them. There are sociable sites with communal spaces and places where the accommodation is secluded and more suited to a romantic retreat. 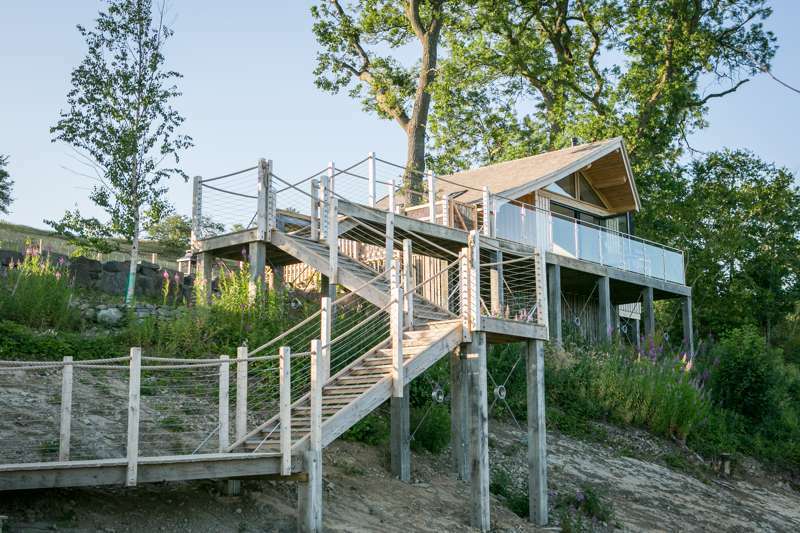 You can stay in bell tents, yurts or tipis, shepherd huts, gypsy caravans or treehouses. 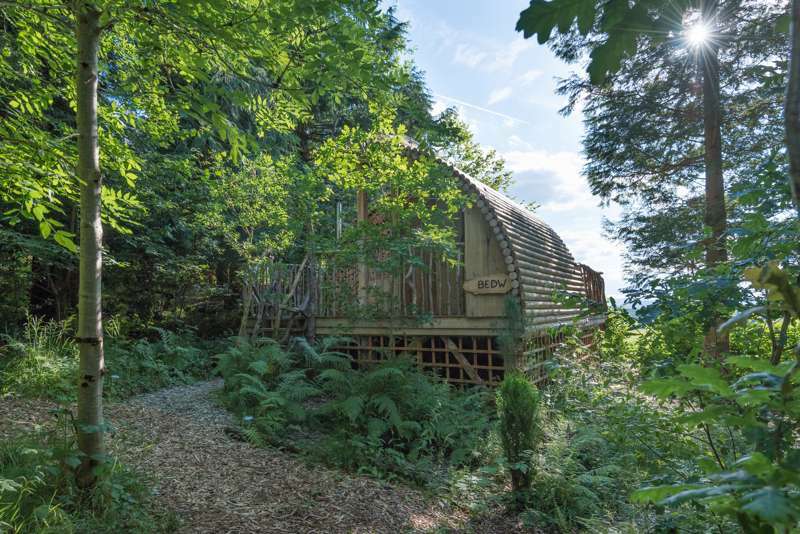 There are modern options too from tree tents and geodesic domes to camping pods and places with all mod cons. The sky is the limit when it comes to luxury and it will be up to you how close to classic camping you want to keep it. If you want as close to a “real” camping as possible, stick with canvas and try glamping in a simply-furnished bell tent, safari tent, tipi or yurt. For more luxury choose a tent that’s been tastefully kitted out and furnished or go for a solid roof over head and, perhaps, a private bathroom or even a hot tub outside. The star attraction of Powys and Mid Wales has to be its national park. Its 520 square miles includes four different mountain ranges: the Brecon Beacons, Fforest Fawr and the distinctly separate but confusingly similar sounding Black Mountains and The Black Mountain Range. The Brecon Beacons are where the high mountains are found including Pen-y-Fan, southern Britain’s highest peak at 866 metres. Hiking to its peak is an irresistible challenge to many but there are plenty of other places to discover too. The Black Mountains in the north-east are popular with walkers and are characterised by grass and heather-clad red sandstone hills and rivers. Situated on the border with Herefordshire this part of the park is easily accessed from Hay-on-Wye and the surrounding areas. The Fforest Fawr massif spans the gap between the high peaks of the central Beacons and The Black Mountain Range in the west of Powys. It has been named by UNESCO as Wales’ first geopark which recognises its geological significance as landscape carved first by ice and later by humans and the industrial revolution. Once a forest it is now mostly agricultural land with isolated hills covered in grass and heather with occasional red sandstone crags. The Black Mountain Range straddles the border with the neighbouring county of Caramarthenshire. It’s highest peaks aren’t far below the central Beacons with Fan Brycheinion at 802 metres. It's mostly red sandstone underfoot but there are bands of harder limestone and millstone grit too with enchanting glacial lakes to discover among the peaks. The entire Brecon Beacons National Park is classified as an International Dark Sky Reserve - great news for campers and glampers as it makes it the perfect place for stargazing. There are 2,000 miles of footpaths in the Brecon Beacons National Park alone making Powys a magnet for hikers and ramblers. You can simply grab an OS Map and plot your own route or you might prefer to set out some of the tried and tested trails to see some of the most spectacular scenery. The Beacons Way passes through the national park east to west, taking in the highest peaks and best views. It’s a 99-mile route in total but, as it’s broken down in to day routes, you can always choose just a short section to tackle. Likewise with the two national trails that pass through Powys. Offa’s Dyke is the longest and most famous of them and follows the route of the 8th century earthworks that separated England and Wales for a full 177 miles. It’s a two-week challenge to take on the full walk (depending on your fitness of course) which stretches right along the border from Prestatyn in the north to Chepstow in the south. Glyndŵr’s Way is the other national trail in Powys and traces a loop from Welshpool to Knighton with its easternmost point at Machynlleth. You’ll still need a sturdy pair of walking boots and at least a week to conquer the whole thing which follows in the footsteps of Welsh revolutionary Owain Glyndŵr, the last Welsh Prince of Wales. There are plenty of more gentle walks in the countryside – the towpath alongside the Monmouthshire and Brecon Canal (Mon and Brec, if you want to sound like a local) is a great place for a gentle stroll. Having said that, the route does form part of the long-distance walk, the Taff Trail too, so you might see some more intrepid trekkers along the way. The five-mile Four Falls Walk is a lovely five-mile route in the national park to see some spectacular waterfalls. It’s described along with other walks on the national park’s website. There are several market towns within the Brecon Beacons National Park that are worth a visit if you’re in the area. Crickhowell on the River Usk is an especially popular place with walkers. Between the Central Beacons and the Black Mountains, it touts itself as a walking hub with an annual walking festival taking place in March and walking routes starting from and passing through the town. There are several outdoor shops here too so it’s a great place to head to if you’ve forgotten the tent pegs! Brecon also has a wealth of outdoor shops and independent food retailers serving the needs of visitors to the area. Also in the Usk Valley, it has a 12th-century cathedral and attractive Georgian buildings in the town centre. Abergavenny in the park’s south east is seen as a gateway to the Brecon Beacons and has an annual food festival in September and a cycling festival in the summer. The area’s best-known festival, however, is the Hay Festival of Arts and Literature. Hay-on-Wye is the perfect place for it as this market town, right on the border with Herefordshire, has a town centre that’s full of specialist and second-hand book shops. Machyllneth in west Powys is another market town that’s popular with visitors. There are a number of places of interest including the Centre for Alternative Technology which has a visitor centre and often has activities for children in the summer holidays. There’s also King Arthur’s Labyrinth, an underground exploration aimed at children that brings legends to life. And if you fancy going underground without the help of a costumed character, perhaps head to the National Showcaves Centre in the very south of Powys where you can explore a number of caves. It wouldn’t be right to visit Wales without calling in on a castle and Powis Castle in Welshpool is a good option. Managed by the National Trust, it has ornate interiors and gardens to explore. Birdwatchers and nature lovers might want to make time to visit the red kite feeding station at Gigrin Farm in Rhayader. Five hides are situated around a trail at the centre which feeds these stunning birds of prey every day. Lake Vvrynwy is another place where nature lovers can look out for birds and wildlife. This five-mile lake is a great place to cycle and walk and has an RSPB visitor centre. • Take a walk. Offa’s Dyke Path, Glyndŵr’s Way, the Taff Trail… there are thousands of miles of walking paths in Powys. The difficulty is in deciding which one to follow. • Pick up some holiday reading from one of the book shops in Hay-on-Wye. • Enjoy a spot of stargazing from your campsite. The Brecon Beacons National Park has some of the darkest skies in Europe so it’s the perfect place for it. • Make a summit attempt. At 886 metres, the Beacon’s highest peak, Pen-y-Fan, might be a bit too far for some but there are plenty of smaller ones too. • Visit a castle. Wales has more castles than any other country in Europe so it would be rude not too. • Find a spot on the border where you can stand with one foot in England and one foot in Wales. • Go bat watching! The Wye Valley, which straddles the border, is internationally important for its bats – especially the rare lesser horseshoe bat. • Head underground. Sign up for an adventurous caving expedition or visit the National Showcaves to see Wales’ underground world. • Watch a waterfall – or walk under one. Rugged Powys has many waterfalls make sure you make a beeline for one of them whether it’s Llanrhaeadr,which has the highest drop, or Sgwd Yr Eira which you can walk behind. • Get a taste for Wales with local produce. Throw a Welsh lamb chop on the barbecue at your campsite, tuck in to a Welsh cake for tea or try some laverbread on your toast. Powys, Mid Wales. 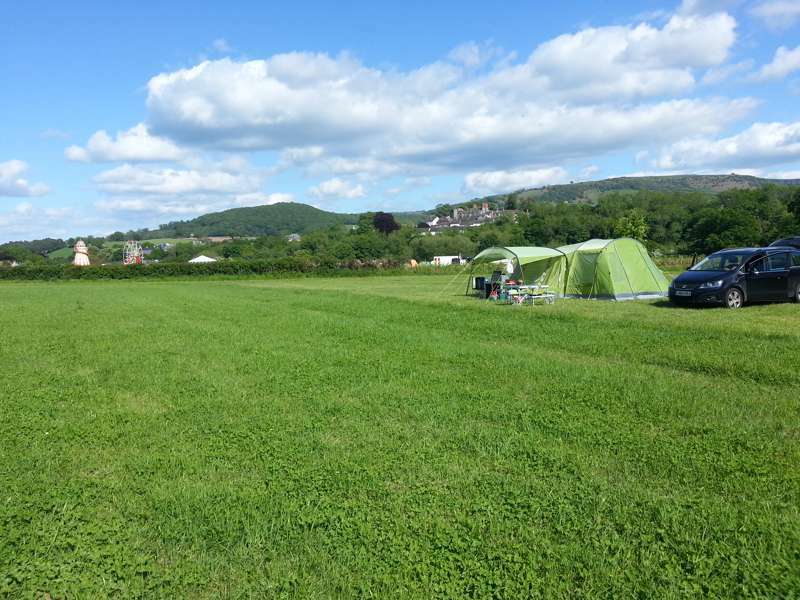 wales, camping, glamping at Campsites in Powys, From hillside campsites to woodland retreats, discover the best Powys campsites here and book online at the best price. With every campsite chosen by the expert Cool Camping team, your guaranteed to find a very special place for your next adventure, including tent-only campsites, luxury campsites, dog-friendly campsites and much, much more.